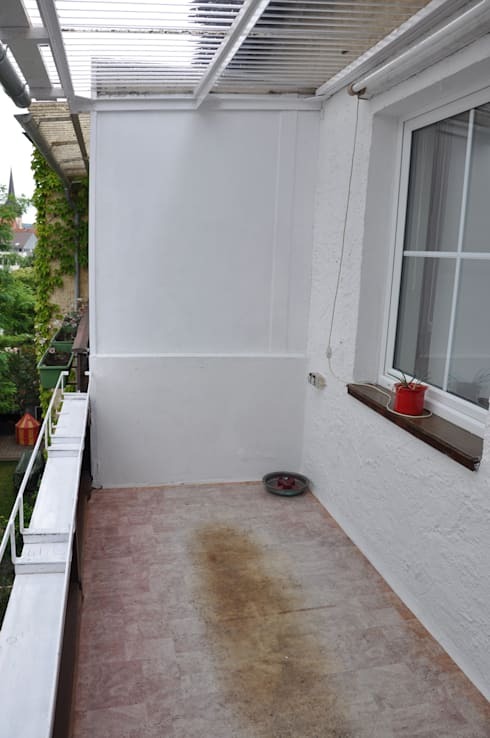 The textured white walls of the balcony were unadorned and looked lifeless prior to the makeover. It was essential to introduce colours and appealing forms to turn this bland space into a cosy outdoor nook. Also, the planters on the balustrade didn’t look very lively, and certainly weren't supporting any glorious blooms. 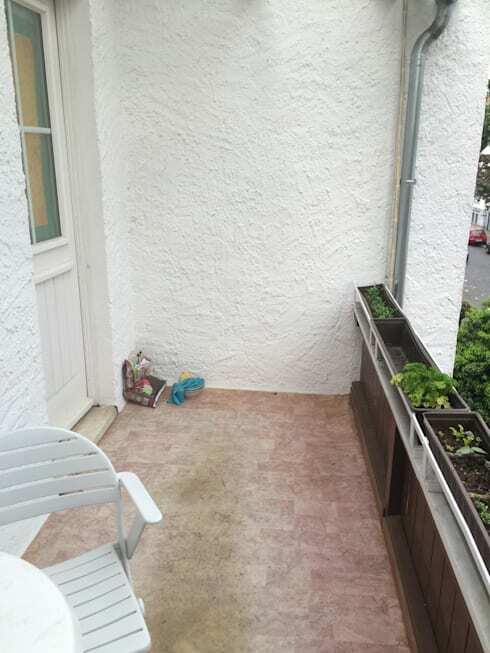 A filthy stain marked the shabby floor of the balcony and made it a completely uninviting space for enjoying fresh air. The windowsill sported a bare and forlorn look, with only a single and shy potted plant sitting on it. The slatted roof of the balcony required an innovative touch too. It's hard to believe that this is the same disappointing balcony we just saw! A bright striped rug now adorns the neat revamped floor, while a compact but beautiful couch with plush upholstery offers comfy seating. The cushions and quirky coffee tables add pops of vibrant joy to the space, along with the quaint white lanterns and other peppy decor accents on the wall. 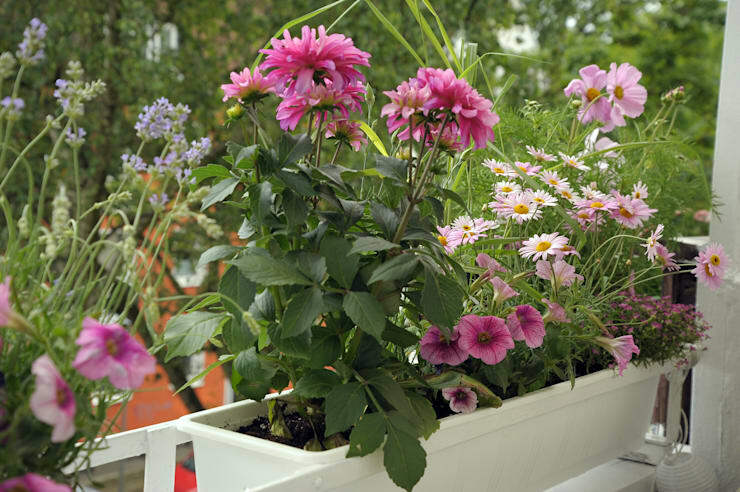 Beautiful white planters now line the balustrade and are brimming with gorgeous pink and purple blooms. A string of snow-white lights adds a hint of fun to the dark wooden balustrade, while lush potted greens line the windowsill too. 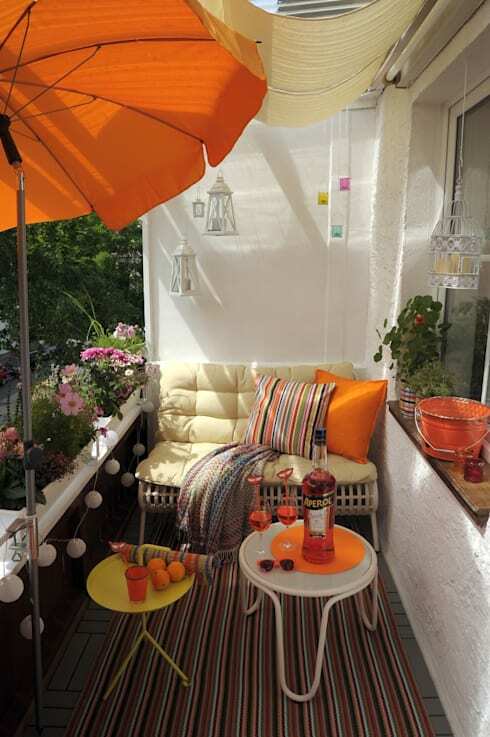 A beige canopy and bright orange umbrella add charming shade to the sunny balcony now. The cushions on the sofa sport vibrant tones and stripes for a happy look and feel, while a colourful throw adds to the snugness of the setting. The stools hold cheery and bright refreshments, ideal for a lazy weekend afternoon. Enticing shades of pink and mauve flowers offer adequate contrast against the white planters, and fill the balcony with a fresh, organic feel. They also look lush and well cared for now. This is the perfect way to enjoy a private mini garden without having to leave your home! A smart armchair fitted with plush and cosy faux fur helps this corner of the balcony to stand out. It also goes well with the neat and slim grey tiles lining the floor. 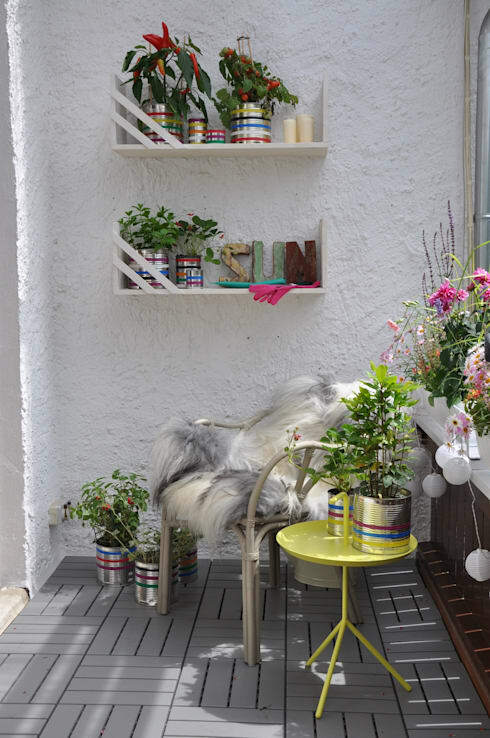 Gleaming tin cans have been recycled and touched up with bright colourful paints, and now act as containers for some lovely greenery. A couple of chic shelves have been added to the wall for displaying flourishing plant life as well as candles and quirky wooden lettering. This bright and funky nook is ideal for leafing through a good book, or enjoying a quiet cup of tea in the morning. So you see how a tiny bit of refurbishment, the addition of happening colours and textures, simple but smart decor ideas and healthy plant life can alter the look of a morose balcony dramatically. 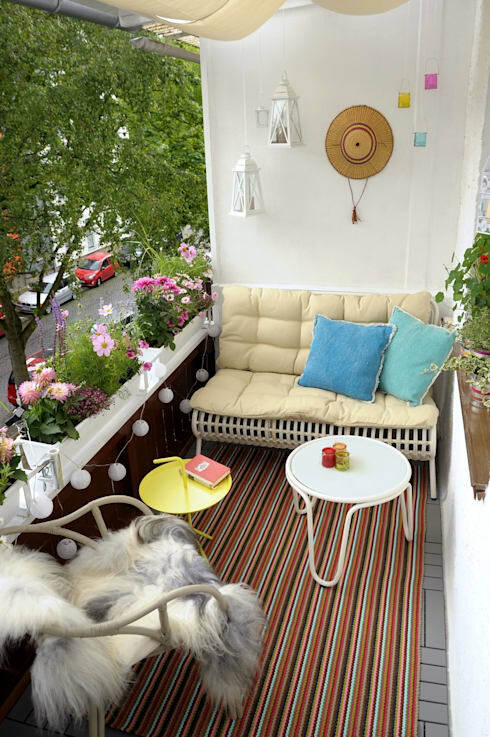 Feel free to take inspiration from these ideas if you have a balcony which needs a makeover, too! Here’s another transformation story which is sure to interest you: Gloomy to glorious: a 37-year-old house breathes new life. Are you a fan of the bright colours and mixed textures used here? Let us know your thoughts!